While in Vegas recently Andrew and I had dinner with some friends. 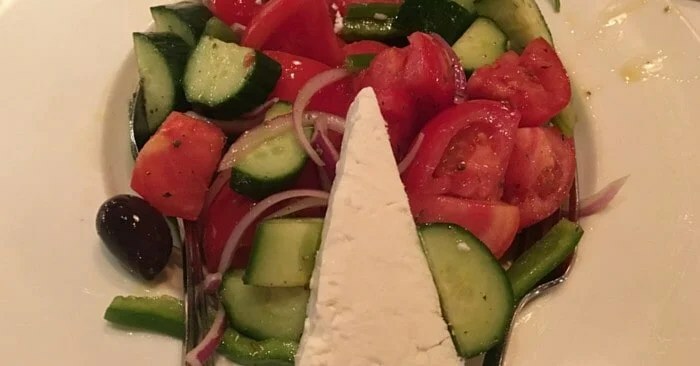 We decided to try one of the finest Greek restaurants in North America, Estiatorio Milos. Andrew and I love a good ribeye every now and then and after previewing the menu online prior to arriving had decided to share (as we very frequently do) a ribeye. If you have eaten at Estiatorio Milos before, you chuckling right about now, but keep reading…it gets better. After arriving, and looking over the complete menu, we asked for some guidance on the menu. Our waiter took the time to give us a very lengthy, informative and oh so impressive lesson on the many very special unique items on the menu. He went through most of the items from the menu, including the high quality Octopus, that I quickly decided to pass on, even I am sure in its own way would have been good given the quality of everything else. He invited us to walk over towards the kitchen, where there was a spread of fish and fresh vegetables at least 25 feet long, referred as the fresh market. We had definitely noticed impressive spread that reminded me of the Pike Place Fish Market in Seattle, only cleaner, better smelling and more organized. 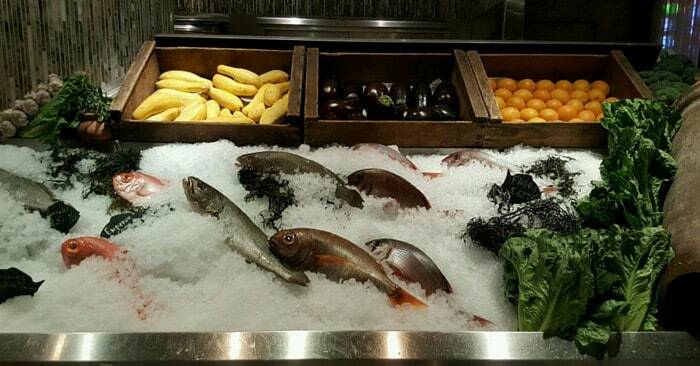 As you can see from the picture, there are many varieties of fish to choose from. I have no doubt we could have chosen any of them and would have been completely satisfied with the quality and taste. All of the seafood is flown in fresh every day and a half, from Greece and I believe Morocco was another one of the many locations he referenced. It was impressive that the item they get from Morocco (if that was the location), he stated, “They believe that (the country/city) to be the best place in the world for (whichever seafood/food item he referenced) right now.” There were several other locations around the world where not only the seafood, but some of the other items such as their chickpeas were also shipped from. Chickpeas…they take the time to order even the chickpeas from the “best” place in the world! They research the best of the best quality of ingredients, have them shipped to them to ensure they only serve the highest quality of dishes. So impressive. Needless to say, Andrew and I quickly decided against the ribeye and turned our sights on one of the very many varieties of fish. In keeping the Greek tradition of family, their items are served family style. 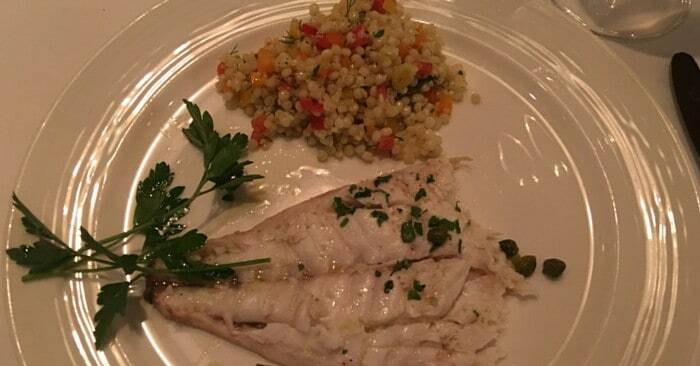 The four of us decided on sashimi tuna, Greek salad, Fresh Herb Couscous and the Balaga fish. We were not disappointed in any way as the food was even better as it was so precisely described. Look at those tomatoes. They were definitely the best I have ever had. The only dressing on the salad was the imported Olive Oil and a little pepper/herbs. It was phenomenal! The couscous was not like any couscous I have eaten before. It was as fresh and exquisite as everything else. The fish was brought to the table still whole. It was cut into fourths and plated for each of us. What an impressive and amazing dinner experience it was! It will be a favorite to visit each time we are in Vegas for a few days from now on! 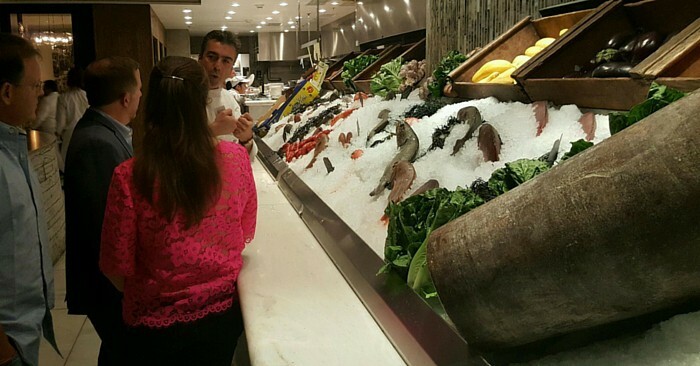 Be sure to visit the Estiatorio Milos restaurant, located in the Cosmopolitan next time you are in Vegas. You will not be disappointed!